Note: I have no connection, business or otherwise, with Kermit Lynch Wine Merchant or his wines. I am just a fan and buyer of his wines. Kermit Lynch has been a fixture in the world of fine European wines since the 70's when he started a small wine shop in Berkeley. Lynch seemed to be a failed musician and hippy who stumbled on to the wine business and fell in love with wine. Shortly after starting his shop, he started traveling to France, finding hidden gems that did not yet have representation in the United States. Slowly he started importing more and more wines, many from producers who were unheard of in the US. Today, he has built his business into one of the most important, and best, import businesses in wine. Part of the reason for Lynch's success is that he personally spent time with and got to know producers throughout France, and a few other parts of Europe as well, to search out the best wines he could find. He has a preference for wines that are naturally made, alive and unique. He avoids homogenized, modern-styled wines without character. And he demands that all the wines he imports are unfiltered and shipped in refrigerated reefers. Why? Because wines that are excessively filtered are stripped of their aroma, color and flavors. Producers do it to produce a stable, clear wine, but they kill their creation in the process. Kermit personally asks each producer, regardless of their prior practices, to bottle the wines they sell to him separately, unfiltered. Another major problem is improper shipping of wine from Europe to the States. That long trip creates ample opportunity for the wine to get cooked and destroyed in transit. Decades ago many of the wines coming to our shores were dead on arrival! Kermit demands that all wines he imports are shipped in refrigerated conditions so that they arrive at your door in the same condition they left the winery. Kermit Lynch still has a small wine shop in Berkeley, on San Pablo Avenue, where he sells all the wines he imports. However, he also distributes his wines around the States, so you don't have to live in Berkeley to benefit from this great range of wines. So why am I telling you about Kermit Lynch? He is a great source for inexpensive but outstanding wines. Yes, some of the producers he represents have become very expensive. Examples include Zind-Humbrecht and Coche-Dury. However, the large majority of his wines are very affordably priced. As I said, he makes it a priority to find great, natural and classic wines from little-known regions and/or producers. Some of my favorite Poor Man's wines, which are both classic and unique and affordable, are imported by Lynch. Three of the wines reviewed in this newsletter, the Salvard Cheverny, Champalou Vouvray and the Perrusset Macon-Villages (see below), are all imported by Kermit Lynch. Other favorites have been included in my prior issue (such as the d'Epire Savennières) and others will certainly be featured in future issues. One of the things that helped to bring Lynch to the forefront of the wine world is his newsletter. Since the 70's he has put out a monthly newsletter, written by himself (although no other employees have started to contribute), which focuses on some of the new producers and wines he has in stock. It is a unique newsletter with fascinating producer profiles and stories from his adventures and travels in the world of wine. Remember the J. Peterman Catalog from Seinfeld? Kermit's newsletter reminds me of that, quirky and fun stories about how he found wines, his impressions and lots of info to absorb. Keep in mind that he has a business interest in the wines he reports on, so they are not unbiased reviews. However, they are very fun and informative regardless. I trust his taste in wines and if I pick from his wines randomly I'd find wine I enjoy 9 times out of 10. You can view past issues of his newsletter and sign up to receive it in the future at his website at http://www.kermitlynch.com. Several years ago, Kermit Lynch wrote a book called "Adventures on the Wine Route" which is a must read for lovers of French wine. It describes many fascinating stories about his early travels and dealings with producers and others in the wine trade. It is both fun and educational, focusing on many off-the-beaten-path regions and wines. I highly recommend it if you have a passion for the wines of France. Are you new to wine and wine tasting? Jump aboard with this new page that helps introduce you to the types of settings you can taste wine. From organizing a home Wine Tasting Party to visiting tasting rooms at the source in wine country, find out your options before jumping in to this fun hobby. Austere? Cassis? Reglisse? What are all these words wine tasters use to describe wines? Here is a list of some of the common descriptors that are used to describe and explain wine. Broaden your wine tasting notes and communication horizons with a better vocabulary. Ok, so this doesn't have anything to do with tasting wine, but what is good wine without good food to go along with it, right? Here is an intro to how you can use wine to bring your cooking to the next level. To start off, I am going to break all my own rules a bit here. While all the wines that follow fit into the "Poor Man's" theme, I thought it would be educational to start out with an example of a truly profound wine, no matter what the price. While mere mortals rarely have the chance to taste a wine like this, it is such a benchmark for fine wine that it can be education to just read about it. The Domaine de la Romanée-Conti is one of the most legendary and sought-after of Burgundy producers. While they produce several Grand Cru red Burgundies and one white, at the pinnacle are two vineyards which are wholly owned by DRC, Romanée-Conti and La Tâche. The former is a tiny appellation which produces one of the world's rarest and most expensive wines. Today they can go for as much as $10,000! And that is for a new vintage! La Tâche is a bit bigger and only a few notches cheaper. Current prices for this 2000 are around $1000 but some vintages can be quite a bit more. Clearly this is a wine for millionaires. But that does not change the fact that they can be some of the most profound, emotional wine tasting experiences possible. I was fortunate enough to taste this wine at a recent tasting event that I attended. One of my friends was generous enough to bring this wine. La Tâche is know for its amazingly complex, spicy and exotic aromas and lush, seductive texture. The best vintages can age for decades or longer. In fact, many need at least a couple decades to show their best. Even in a vintage that is not considered the very best in Burgundy, this amazing vineyard's terroir shows through in spades! Immediately upon pouring an awesome perfume of Asian spices like five-spice powder, herbs, soy and spicy red and black fruit liquors jump from the glass and literally envelope the senses. I am always taken by the exansiveness of la Tache's aromas. With most other wines, when you first put your nose in that glass and inhale, you get the most intense sense of the aroma up front, with subtle hints trailing. With la Tache it seems like the more you inhale the more it expands and gets better and better. A long drawn out whiff expands to become so complex, heady and overwhelming. The mouth did not disappoint either, rich and seductive yet ethereal. Seems impossible to be so mineral driven and focused and yet so lush and seductive at the same time. Truly great stuff! Three Stars. Importer: Wilson-Daniels, St. Helena, CA. Domaine de la Guilloterie (Duveau) "Accordance"
The Loire valley in France is one of my favorite wine producing regions, if you haven't figured that out already. 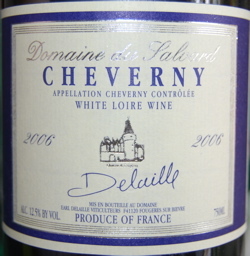 In particular, the white wines made from Chenin Blanc in regions like Savennières and Vouvray can be outstanding. While most of the whites made in the Loire are still wines, they can make some outstanding sparklers! And if you believe some people, they have been making bubbly for longer than Champagne! This wine is a blend of 80% Chenin Blanc and 20% Chardonnay (two of my favorite white grapes), bottled in the traditional style, with full-on bubbles. The nose of this one surprised me, almost Champagne-like with a rich, creamy, even buttery fruit. Not as complex as a fine Champagne, a simple but fresh and pure aroma. This one is creamy and silky in the mouth. Again, simple, without a ton of depth, but who the heck cares, this is just fun and refreshing! No hard edges that some cheaper sparklers can have. The wife said this was the best French sparkling wine she's had under $20! One Solid Star and a great value. Importer: Wine Warehouse, Los Angeles, CA. Prosecco is the name of both the grape and a region in Italy that produces bright, crisp sparkling wines which can be a great value for inexpensive bubbly. The are great as an apéritif and also pair well with many foods because of their good acid balance and bright, simply flavors. This one is becoming almost as ubiquitous as Veuve Cliquot is for Champagne. In fact, the similarity doesn't stop there as they both have a bright orange label which is quite hard to miss. You can find it in many markets these days. The fruity melon and honey aromas lead the way to a simple, fruity wine with good body and a bit of balancing acidity. This has a slight hint of sweetness, a bit more so than many brut Proseccos but still nicely balanced. A nice, simple sparkler for easy summer drinking. One Star. Importer: MW Imports, Brooklyn, NY. 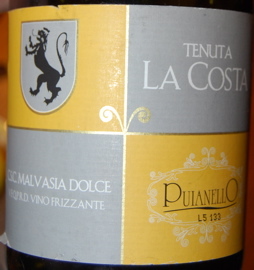 This lovely wine comes from the appellation of Colli di Scandiano e di Canossa in the Emilia-Romagna region of Italy. 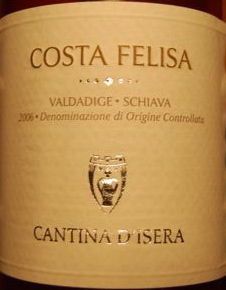 The grape is Malvasia and it is a Frizzante. 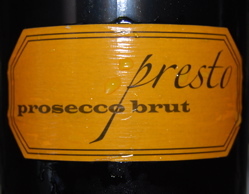 This is about as bubbly as a Prosecco Frizzante but sweeter than your typical Prosecco, but not as sweet as most Moscato d'Asti. Therefore, this is not really a dessert wine, but more of an aperitif or food wine. This is just a lovely, no pretension, slightly sweet sparkler that is just simply charming. It is impossible not to like this wine. It has a perfumed nose of rose petals, ripe peach and Mandarin oranges. The flavors mirror the aromas with an off-dry sweetness with is very mellow and never cloying. Pairs absolutely beautifully with spicy Indian cuisine. The wife loves it for its sweet fruit (she calls it her "sweetie wine"), I love it for its pure, unadulterated fun. Not an intellectual wine that will blow you away with its size, complexity and length. Simply a wine of pure pleasure. Two Stars. Importer: Vitis Imports, Santa Monica, CA. You know I love Champagne. But Champagne prices are quite ridiculous these days. The big name Champs can easily cost you well over $100. However, the movement toward small "grower" Champagnes is well underway and some of the best Champers around are from these small, quality-obsessed producers. 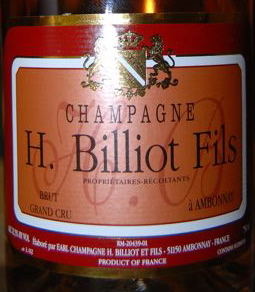 Billiot is not new, he is one of the kings of the region and make beautiful Champagnes. You can see a review of his Cuvée Laetitia on my Champange Tasting Notes page. This one is his non-vintage Brut Rosé. I don't know the disgorgement date as it was not printed on the bottle or cork. I'm gonna get a bit poetic for this tasting note. The best way I can describe this wine is that the sensory experience was akin to climbing a craggy rock terrace while picking wild strawberries and raspberries along the way. Very dry, letting the natural fruit and stones speak for themselves. Pure natural beauty. I really like this Rosé! Two Stars Plus. Savennières is one of my favorite appellations in the Loire Valley. Producing mostly dry wines from 100% Chenin Blanc, they can be intense, complex and long-lived wines. This producer, Baumard, who also produces world class wines from several adjacent areas in the Loire, makes some of the best Savennières around. 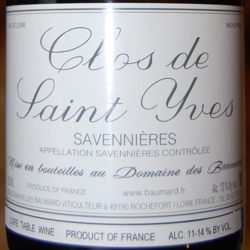 This vineyard, Clos de Saint Yves, is a monopole meaning that they are the sole owners of it. I usually prefer the Clos du Papillon which can be one of my favorite wines in the world, but this is splitting hairs; and besides, that wine is generally 5 to 15 dollars more expensive. 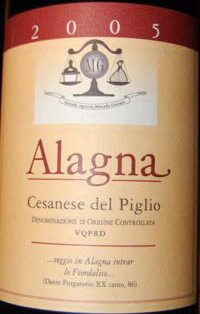 This wine showed well but young with subtle aromas of flowers, almond, wool and chalky stones. With aeration, sitting in the glass, it opened up over an hour or so to show honeysuckle and more wool. In the mouth this is a baby, not yet showing off all it has to offer. It has intense minerals, chalk, wool and a waxy quality. Right now the fruit is secondary, lurking the background but definitely there. With air it showed a bit more honeyed peach and melon. An excellent wine but very young and will only get better. Two Stars. Importer: Premier Cru, Oakland, CA. This producer, located in Rivesaltes in the south of France, not far from the Spanish border, makes this wine from 80% Muscat and 20% Viognier. The grapes come from an area near Corbières. It is a curious mix of two un-related grape varietals given that Muscat is grown in Alsace and the south and Viognier comes primarily from the Northern Rhône Valley. But somehow it works. Spicy, almost ginger ale-like aromas and floral, fruity viognier blend in the nose. The texture is waxy, mildly fruity and has both a floral Viognier hint and a honeyed Muscat note. Nice basic floral, aromatic wine. One Star. Vouvray is a small appellation in France's Loire Valley. It produces wine exclusively from the Chenin Blanc grape and produces wines in styles varying from bone dry to sticky sweet. 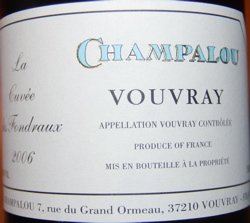 This small producer makes excellent quality wines exclusively from Vouvray. 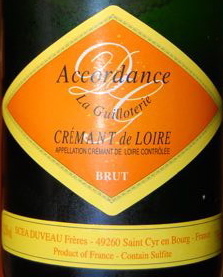 They have a basic sec in addition to this special bottling called "La Cuvée des Fondraux". A young, fresh nose of melon, apple and flowers leads the way to a round and caressing mouthful of fresh fruit with good flinty minerality, petrol and waxy lychee fruit. Only a hint of well-balanced sweetness. A nice floral inner mouth perfume lingers on the smokey finish. This is simply very pretty and while some prior vintages of this wine have seemed a bit flabby for my taste this has clearly taken a step up the quality ladder and has very good balance and thrust. This is delicious now but should improve with a few years in the cellar. Two Stars. Importer: Kermit Lynch Wine Merchant, Berkeley, CA. This is a really interesting wine that is off the beaten path! It comes from a small region in France called the Jura, which is at the foothills of the Alps near the Swiss border, not far from Savoie. 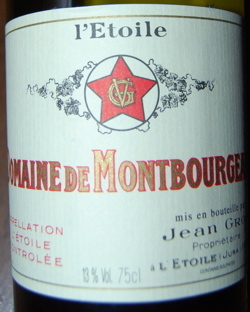 This tiny appellation, l'Etoile, produces wine mostly from Chardonnay. In fact, this wine is almost 100% Chardonnay, although it can include small amounts of Savagnin, vines of which are scattered in the vineyards. l'Etoile means "the star" and this wine comes in a strange, old-school bottle with "Jura" embossed on it with a wax capsule. These wines are unique in that the wine is not topped-off in the barrels as they age. This means that as wine evaporates a "flor" develops on top of the wine, similar to Sherry. This leads to a gentle oxidation which can give them a cool nutty, Sherry-like aroma and flavor. While this hint of oxidation can be surprising and even off-putting to people who are not accustomed to it, it can be quite interesting and adds a unique complexity to the wines. While uncontrolled oxidation in other types of wines, such as in white Burgundies, can lead to a flabby wine which can be undrinkable, in the controlled conditions of Sherry and these Jura wines, it can exist alongside a rich, structurally sound wine with vibrance and good acidity. Definitely interesting wines that many people, even seasoned wine lovers, do not know about! Enough already, lets taste the wine! This has a great nose of smokey, roasted nuts and pungent cheeses something like a mix of old, aged Gouda and Morbier. Definitely a nose for people with an open mind. If you love stinky cheese and nuts, you'll love this wine. If not, it may be off-putting and an aquired taste and you should build up to this slowly! The mouth is powerful and rich, with honeyed nuts, mirroring the nose, and a nice mineral acidity. It also has a bit of tannic grip, which you don't get in most white wines. While I don't have experience with old wines from l'Etoile, I would be surprised if this didn't age nicely as it has great depth, balance and ample acidity and tannin. If I had to compare it to something, this unique wine is like a hypothetical blend of slightly oxidized white Burgundy, Hermitage blanc and a splash of Sherry. Given that most great Burgundy is prohibitively expensive now and that there are issues with oxidation (see above), this is a great white Burgundy alternative! Two Stars. Importer: Rosenthal Wine Merchant, New York, NY. In case you weren't yet aware, Burgundy has gotten expensive! Far from the Poor Man's best values, the best Burgundy, both red and white, have gotten so expensive that your average Joe rarely can afford a bottle. Even lesser villages and vineyards can easily cost you $50 and up and the best producers from good vineyards can be hundreds of dollars or more. 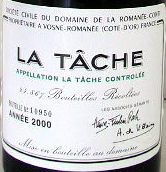 See my review of the La Tâche above as an example of ridiculously expensive, but great, Burgundy. So what is the key to being able to enjoy some good Burgundian Chardonnay or Pinot Noir without the price-tag? Stick to the sub-regions which are either not as well known or do not have as great a reputation. Take this wine for example, it is 100% Chardonnay from Burgundy, but rather from being on the Côte d'Or, the most sought after part of Burgundy, it is from the Maconnaise further south. Along with the Chalonnais and Beaujolais, these southern regions of Burgundy can still produce excellent wines at more affordable prices. This Macon wine has a rich honey and butterscotch nose followed by a mouthful of stoney, granite-like fruits and honeyed pear. The oyster-shell, mineral-laden feel and fine texture make this wine drink well above its reasonable price tag. This would be a great, refreshing wine to drink in the summer with raw oysters on the half shell or other shellfish dishes. An excellent alternative to Chablis and an eye opener for those who think all Chardonnay tastes like the buttery, oaky fruit bombs you can find in California. Drop that food un-friendly stuff and wake up your palate with this living wine! Two Stars. Importer: Kermit Lynch Wine Merchant, Berkeley, CA. Cheverny is an off-the-beaten-path appellation in the backwaters of the Loire Valley. It produces white wines made primarily from Sauvignon Blanc but often with a splash of Chardonnay blended in, as in this wine. The wines of this area do not have nearly the exposure and reputation of other Sauv Blanc appellations like Sancerre and Pouilly-Fumé. But that is good news for us, because lovely wines like this can be had for song. Bright, grassy classic Sauvignon Blanc aromas. Crisp, Sancerre-like gooseberry, hay and hint of minerals in the flavors. This is zesty and refreshing, just complex enough but not so serious. This is just calling out for some good seafood. An excellent alternative to Sancerre, Pouilly-Fumé or New Zealand Sauv Blanc. Two Stars. Importer: Kermit Lynch Wine Merchant, Berkeley, CA. Alsace is a small region in the northeastern part of France, near the border with Germany. Not surprisingly, much of the food and architecture, and even the wines, somewhat resemble German styles. But don't suggest to the Alsatians that they are anything but French! This wine is a Riesling from a Grand Cru vineyard and old vines. It is a producer I have not had much experience with but have heard good things so I was eager to jump in. The nose is immediately grand cru wonderful aromas of slatey minerals, gunflint, honey, petrol and peach pit. This is the kind of nose I love, making me think the wine was etched right from the living rock of the Earth! The flavors are also intense, but quite tight and closed up right now. Intense steely pit fruits, dry, vibrant and bright. This is a wine of seemingly paradoxical contrasts (as good Riesling often is), ethereal yet at the same time intense; light as a feather on the palate, yet full of flavor. Because of how tight this is it would probably do best right now with some shellfish like raw oysters on the half-shell. However, I'm convinced this will just get better with age and fill out a bit on the palate. Two Stars. Importer: Beaune Imports, Berkeley, CA. Rosato is the Italian name for Rosé, a pink to salmon-colored wine that is somewhere between red and white. Good ones make great summer sipping, slightly chilled, either on their own or with a host of different appetizers and other foods. This one is bright and refreshing with aromas of red fruits and sea air. Vibrant brine and juicy red fruit flavors, almost spicy. Very drinkable and great with food. This is what rosato is all about. One Star Plus. Importer: Vitis Imports, Inglewood, CA. 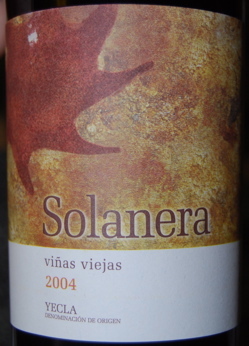 This is a red wine made from old vines (viñas viegas) in Yecla, in the south of Spain. It is made from a blend of 65% Monastrell, 20% Cabernet Sauvignon and 15% Tintorera. Monastrell is the Spanish name for the same grape as Mourvèdre, grown commonly in the south of France. This inexpensive wine has ripe, sappy cassis and blackberry aromas with a bit of smokey oak and match stick from the oak aging. The flavors are also ripe and rich with an almost raisined, slightly over-ripe black fruit profile. Fairly simple and grapey but with a bit of complexity added by the toasty oak. Modern in style but tasty and rich. Not quite typical for Monastrell/Mourvèdre, but if you like fruit forward wines in a modern style then this is certainly attractive. One Star. Importer: European Cellars, LLC. Charlotte, NC. Rioja is one of the best known regions in Spain. It is in the northeast of the country and for red wines the most prominent grape in most wines is Tempranillo, although it can be blended with several other local varieties. This wine contains 80% Tempranillo with Garnacha, Mazuelo and Graciano making up the difference. This is the crianza bottling, which is aged 15 months in oak followed by 6 to 8 months in bottle prior to release. They also make Reserva and Gran Reserva versions, the former being aged longer in bottle prior to release and the latter being aged 22 months in oak followed by up to 50 months in bottle. This wine is a Pinot Noir look-alike with fresh aromas of cherries and raspberries spiced by charred earth. With air got richer Barolo-like notes of tar and roses. The flavors are earthy, tart red fruits which lengthened and got meatier with air. A very nice, inexpensive Rioja. One Star Plus. Importer: Vitis Imports, Inglewood, CA. Garrigue is the French name for the undergrowth and scrub brush that grows wildly on the hillsides of the south of France. While that may sound uninteresting, the term is often used longingly to describe the wonderful aromas of strolling through those wild hills during the summer, aromas of wild lavender, rosemary and thyme filling the air. 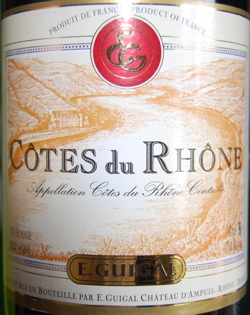 This wine is from the Côtes du Rhône which is a large appellation in the Rhone Valley. It can include wines from both the Northern Rhone as well as the Southern Rhone. This wine comes from the latter. It is a typical southern blend of 65% Grenache, 25% Mourv&grave;dre and 10% Syrah. The wines from the north typically contain a much higher percentage of Syrah. As the name might imply, the generous nose of this wine offers dusty brush covered hillside scents with herbs, strawberry and cranberry. With some air this got quite peppery and dark and certainly in the mouth that pepperiness shows up. Spicy, peppered, crunchy red and black fruit flavors are quite dark and dense yet airy and light at the same time. Not a powerhouse finish and a bit on the rustic side with coarse, grippy tannins, but shouldn't it be? This is pretty typically for a Côtes du Rhône. This would certainly do nicely with some well-marbled beef, a daube or a nice leg of lamb. One Star. Importer: Eric Solomon/European Cellar Selection, European Cellars, LLC, Charlotte, NC. Cesanese is an Italian varietal which typically gives a spicy flavored wine...or so I've heard! This was my first example that I can remember! It comes from Italy not far from Roma. Initially this had a very weird aroma! A musky and stinky aroma that I could only describe as "baby poop"! Not an enticing aroma to find in your wine! I have had many a wine that was "stinky" with earthy, even barn-yardy aromas that surprisingly can be quite interesting and pleasant in the context of the wine. However, this was not pleasant. My thought was that it was perhaps Brett or some other contaminant. I hoped it would blow off. You can read a bit more about Brettanomyces on our Wine Aroma page. Some time paid off! After about an hour in the glass, this strange wine turned into an earthy, cedar box and tobacco aroma that was far from unpleasant! A strange but welcomed transformation. The flavors were of velvety black fruits with a quite spicy finish that is quite unique. Zesty and lusty, this is quite nice and hard to put down. A solid One Star Plus, I was tempted to give it two stars, but its strange beginning has me a bit on guard. Importer: Vitis Imports, Inglewood, CA. Guigal is a huge name in the world of fine wine. Their top cuvées, particularly their single-vineyard Côte-Rôties, are highly sought after, fetching hundreds of dollars a bottle on releases. They make wines at every level and most appellations from the Rhone Valley from the north to the south. 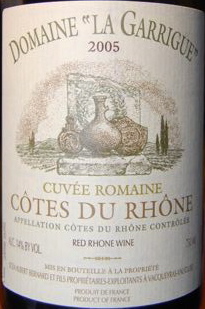 This Côtes du Rhône, a large appellation the can include parts from both the north and south, is one of their largest production wines and can be found just about anywhere in the modern world. However, it does still seem to offer good value. 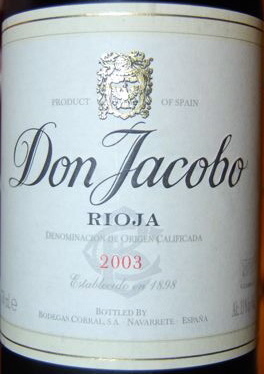 Smokey, meaty black fruits on the nose lead to quite rich, smokey fruit with a bit of oak noticable. Simple but flavorful and full bodied. It does tend toward the more modern style, but offers a lot of depth for the meager price tag. One Star. Port is the fortified wine of Portugal's Douro Valley. If you don't know what a fortified wine is, see my How is Wine Made page to learn a bit more about it! In general, it is a wine to which a grape spirit is added (fortified) during fermentation to halt fermentation. This results in a more alcoholic wine generally with some residual sugar. Therefore, port is a sweet wine which is generally consumed as a dessert wine or digestif. They are great served with Stilton cheese! Taylor is one of the oldest (since 1692!) Port houses and produces some of the best Ports. 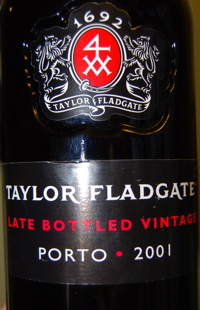 Their vintage ports are outstanding and very long lived, often needing several decades to become fully mature! This is a Late Bottled Vintage, or LBV, which means that it was held in oak longer than a Vintage Port prior to bottling. This extended aging in oak, although not as long as for a Tawny Port, softens the wine and allows it to develop further complexity so that it is ready to drink upon release. This particular LBV is from 2001 and was bottled in 2007. While they can age in bottle some, they do not need it and may not change appreciably. This Port has a big bold nose of rich, sappy cassis, licorice and blackberry liquor accented with baking spices and confectioner's sugar! Quite dense and ripe for an LBV, even a bit smokey. The flavors are also rich and dark, like a liquor of black fruits. Velvety texture and this is really drinkable already. This is about as good as LBV gets in my experience! While it will last a long time, it is not likely to get much better. Two Stars. Importer: Kobrand Corporation, New York, NY.